David Barnett posted a lovely etymology of the word “hack” in today’s UK Guardian Book Blog. In it he chronicles the rise and fall of the word, with all its connotations from a horse to a paltry writer to a loud and proud reporter. “We in newspapers rarely admit to literary pretensions”—ouch, that’s a little rough for the writers out there. 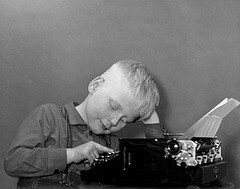 Barnett’s point is that no writer writes truly for the love of writing,—“And which among our leading literary lights today writes purely for the love of it” (again, debatable because I’d bet my paycheck that Salman Rushdie and Seamus Heaney write because they love it)—there’s always a monetary element, and, somehow, journalism trumps the pretension of art by announcing forthright that it is a career, a vocation that actually pays. How exactly did the mass market come into play? If a hack is a writer who hires himself out, how does that automatically imply the largest readership out there—the folks who read Nora Roberts’ romance novels and Stephen King’s horror stories (I’m not debating the literary quality of both of these writers, I’m just admitting that they line the mass market paperback shelves of your local bookstore). Does writing, as Barnett claims to have done, “two novels, a couple of short stories, a radio sitcom and a comic book script” make him a hack (and how is that different than any other writer out there, simply the amount of material)? How many people have read his short stories or his novels, and, really, how much did he make off them? Most writers will agree, you don’t get paid much from royalties (unless you are the aforementioned Nora Roberts or Stephen King). Furthermore, what separates his novels and short stories from the literary pretensions of non-hack writers?